Dimitris Maronidis (1980, Greece) composes acoustic, electroacoustic, mixed media and interactive music. In his most recent works he tries to bring together these fields and he explores extensively algorithmic processes for organizing his musical material. He uses technology to experiment, explore and expand the properties of sound. Dimitris has studied Counterpoint, Orchestration and Composition at the State Conservatory of Thessaloniki and Aristotle University of Thessaloniki. 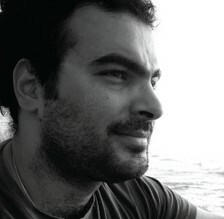 In 2009 he completed his PhD in Music Composition at the University of York, with financial support granted by the State Scholarships Foundation of Greece. In 2011 he moved to United States of America and pursued a post-doc research as a visiting Fulbright scholar at Harvard University. He has studied computer music at the Institute of Psychoacoustics (IPSA) in an experimental project held at the Aristotle University in collaboration with the American Hellenic Educational Progressive Association (AHEPA). There he was introduced to the techniques of computer assisted composition (CAC) and electronic music. X Anthèmes is based on national anthems from various countries around the globe. National anthems are, with very few exceptions, heavily militaristic, “serious” music. In this piece they are processed, reformed and re-presented from a virtuosic, lighter and more translucent perspective. Although the selection of the Anthems was made solely with artistic criteria, the reformation itself can be considered as a political statement.